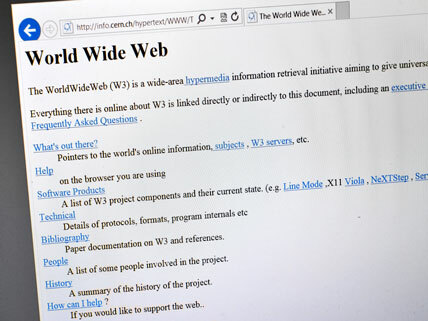 March 12 marked the “birthday” of the World Wide Web (WWW, or W3). It was first proposed by Tim Berners-Lee, a software engineer for CERN (the European Organization for Nuclear Research), as an information-management system for the Internet. In just a quarter century, the World Wide Web has been adopted by virtually every society on the planet. What exactly is the Web? It is not synonymous with the Internet; think of it as the flesh that makes the Internet backbone visible. Browsers, search engines, and social networks all rely on the Web. It is fundamental to the rich connectivity that many people now take for granted. It’s a good thing that CERN decided, in 1993, to make it available to anyone royalty-free. The Web was a disruptive technology—not unlike the automobile or electricity. A recent study by the Pew Research Internet Project summarizes its impact: the Web changed “the way people get, share, and create news; the way they take care of their health; the way they perform their jobs; the way they learn; the nature of their political activity; their interactions with government; the style and scope of their communications with friends and family; and the way they organize in communities.” Consider this snapshot of the Web’s transformative pace: July 1992, the first photograph is posted; 2012, Facebook alone is handling more than 50 billion photos online. The Pew survey reports that Internet use by American adults has reached 97 percent among 18- to 29-year-olds. Ownership of smartphones (the mobile Web) has grown from 35 percent to 58 percent in just the last three years. Interestingly, nine out of ten Internet users say it has been a good thing for them personally, though slightly lower percentages see it as a good thing for society at large. And two-thirds of users report that online communication has strengthened relationships with family and friends. The WWW’s 25th birthday has also provided an occasion for observers of the interaction of technology and society to warn of increasing government surveillance, erosion of privacy, cyberterrorism, and other threats of the digital age. This light-hearted article recounts the history of the Web via a timeline. How Disruptive Was the World Wide Web in Just 25 Years? This article focuses on the explosive adoption of the WWW. View the findings of this major survey of Internet use in the United States, which was undertaken to coincide with the 25th anniversary of the creation of the WWW. This article includes the perspective of the WWW’s inventor on threats to the online community. This Web page explains the difference between the WWW and the Internet.